The Wafd party's board decided Friday afternoon to expel several leading members who have recently formed an opposition group against the current party head El-Sayid El-Badawy as internal crisis continues to rock Egypt's oldest liberal party. In a meeting at the party's headquarters in Giza, the Wafd's high board expelled seven board members including Fouad Badrawy, Essam Sheha, Sherif Taher and Yassin Tag El-Din from the party permanently. "El-Sayidd El-Badawy broke the agreement he reached with Wafd's reformist front during our meeting with president El-Sisi," leading Wafd party member Sherif Taher told Ahram Online. Al-Wafd party's crisis started in April when at least 1,200 Wafd Party members, calling themselves the Wafd’s reform front, convened in Sharqiya governorate to constitute a Reform Front. The front withdrew confidence in party leader El-Badawy, accusing him of abuse of power and absolute authoritarianism. 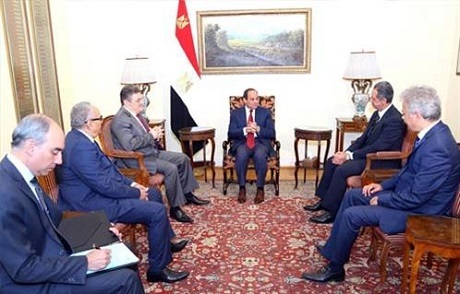 In early May, President Abdel Fattah El-Sisi attempted to mediate reconciliation between the warring factions in the party at a meetingwith the Wafd party's leading members at the presidential palace. Following the meeting with the president, both El-Badawy and the reformist faction members welcomed what they considered to be a presidential initiative to end the crisis. However, days later divisions resurfaced again. According to Taher, El-Badawy ignored all the demands of the reformist faction, including the adoption of democratic bylaws and the reinstatement of all the members who had been fired earlier. "He only appointed seven members from the reformist faction -- including me -- on the new board, ignoring all the other demands before taking a decision to expel us at a board meeting today, " Taher added. DTaher and his colleagues say they will continue working with Wafd members across the country until El-Badawy leaves the party. "It is an escalation that will be met with an escalation," Taher told Ahram Online. Nothing wrong with suspended some members of their membership when they violate the party dogma. It happens everywhere. I personally resigned because of my discontent with the local chapter members. We need 100+ to understand democracy. Democracy was working just fine under Morsi but Anti-national elements like Sisi destroyed it for his personal gains.